The election then moved to the final stage and Dr Davies was elected. In a surprise move, Canon Smith appeared on the Synod floor and was given leave to move a motion proposing Bishop Davies name be moved to the ‘final list’, the last stage of the electoral process. 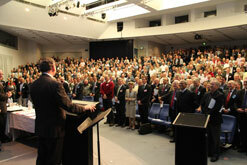 Canon Smith was given a standing ovation by the Synod delegates. He also led the group in prayer for Dr Davies in his new role. Both men have stressed their friendship and close working relationship in the church. Bishop Davies is an experienced leader, overseeing a large region of Sydney parishes and multi-cultural ministries as well as roles in the Australian church and internationally. The Bishop of Singapore, the Right Reverend Rennis Ponniah, gave the Synod Bible study, saying it was a privilege to be present on what he described as ‘a significant and moving night’ for the Diocese of Sydney. “We trust in God. So, rest in God’s faithfulness and go forward to contend for the Gospel.” Bishop Ponniah said. After the vote was announced, the Archbishop-elect entered the theatre with his wife Dianne, to sustained applause and a standing ovation. He thanked Synod for the vote, which was carried on the hands overwhelmingly, without dissent in either house. He then read from a New Testament given to him at his ordination by Sir Marcus Loane in 1981. Dr Davies will be officially inaugurated as Archbishop at St Andrew’s Cathedral on Friday, August 23rd. It’s been an extraordinary day and perhaps I’ll write a little more about it later this week. For now we give thanks for God’s providence and an extraordinary measure of grace and peace, χαρις και ειρηνη, given to Synod tonight. χαρις και ειρηνη – a fitting summary, well done! Charles, I’ll let your comment stand since I think it speaks for itself. God is always in control and it is the Lord who always puts every leader in place to fulfill His ultimate purposes. A recent verse the Lord drew my attention to when I was having my time with Him in His Word. No matter what plans men may have if they don’t line up with Gods they will fail. Trusting it all into God’s hands. Charles — as a Glenn Davies supporter, I find your comment A. Offensive and B. Wrong. Thank you. Hi David – I note that elsewhere (http://www.standfirminfaith.com/?/sf/page/30710) you write that “Philip has taken [steps] since then to amend matters and to publicly affirm and support Davies,” and you note that Julia Baird failed to mention these. Given that you think she should have referred to them, could you please tell me what they are? I assume there is more to it than writing a rather bland piece on his website, and deleting that ridiculous article about those evil covenantal calvinists. Well, you call it “rather bland”. I think that’s a little unfair but each to his own. I can’t speak for Phillip. You’re obviously not satisfied with what he did. I assumed your question was somewhat rhetorical and treated it as such. I assume he isn’t satisfied with it either – hence the delation. But mea culpa for any gratuitous rhetoric. It was in fact a genuine question. I’m not asking you to speak for Phillip; you imply that there were facts that Baird omitted, and I’m just wondering if there were additional steps taken “to amend matters and to publicly affirm and support Davies,” other that the [insert adjective here] articles on his website. In his speech at synod, Davies said that Phillip had called him and apologised and that their relationship was restored. Nevertheless Baird (and sadly others much closer to the synod) are still trying to make hay. Thanks David – I wasn’t aware of the actions described in the first paragraph, and I agree with the second! “In his speech at synod, Davies said that Phillip had called him and apologised and that their relationship was restored. Oh yes they have been doing that since Phil was on Campus at the UNSW (I was on campus when Phil was the chaplin there, we were referred to as Jensenites). Nothing has changed much. Phil has always been a man with an opinion but he is a Goldy man first and foremost. I have often seen Phil apologise where need be and try to reconcile. A credit to him as I have a similar personality and I know it is hard to make amends after you have spouted off. Despite who is in charge (so to speak) of the Anglican Church here in Sydney I am sure that Ministers who are truly walking closely with the Lord will be accepting this as God’s divine will and lifting Glen Davies up in prayer. Everything is Ultimately God’s and He will have His hand on the future of the Anglican Church for His plans and purposes. I have no doubt of this and rest easy. Do pray for all the ministers it isn’t an easy job in the best of times and these days I am sure it is getting harder especially since Christianity is not favoured as it once was by society in general. I’m quite sure that Phillip is indeed a godly and sincere man, with a genuine desire to be reconciled to those whom he has wronged, mindful of the costly reconciliation that God initiated in Christ and by his covenants. But certain wrongs, and certain patterns of wrongs, can make even the most genuine and well intended arrangements untenable. The recent events within the ALP are a case in point – with some ministers having the decency to resign. I would suggest that making deliberately misleading statements, and impinging upon the theological convictions in the way that Phillip did, might fall also into this category. I hope it is indeed the case that “ministers who are truly walking closely with the Lord will be accepting this as God’s divine will and lifting Glen Davies up in prayer.” As for Phillip, I’m glad I’m a presbyterian and don’t need to worry about deans or cathedrals, and especially the Dean of the Cathedral. God’s mercies mate are New every Morning. If others in the Anglican Diocese can’t forgive and move on after Phillip has once again made one of his strong worded opposition in his views they have no place being a Shepherd of God’s Flock. Good grief even Paul and Barnabas had a huge fall out over Mark. Neither was expected to resign his commission. They were annointed to be God’s Shepherds NOT VOTED IN by the disciples or followers of “the way”. I don’t personally agree with Phil on everything he preaches but I understand his personality and having a personal relationship with him in the past I am I guess a bit more forgiving than others might be. As for Paul and Barnabas and Mark. We find that later they had obvisouly reconciled. Our Ministers are not Politicians but men who have given up their lives to serve God and care for His flocks. Even in the Bible we see there are disagreements between Believers in Ministry. The rule of thumb is for them to learn to get over their differences as they seek to serve God together. BTW I’m not a card carrying Anglican, never felt I had to convert from my family’s Eastern European denomination. I have a family member that did convert to become a Presbyterian but he found out that it was mandatory if he was to become a Minister for them (LOL). He has a parish up in Brisbane. We speak often and have a regular good time of sharing and praying for our various family members together. He has no problems with me in the Anglican Church. We have a few family who have come to Christ through school friends or work mates. They attend various Protestant Churches around Sydney or in the city where they reside. So we don’t have any denominational prejudices as we are all just happy that various family members have repented and received Christ. Yes we do have doctrinal differences but we are all Saved through Christ. I hope and pray God will enable us to learn His word as His Spirit reveals it to us individually. We will be in heaven together and that is what counts. What Biblical knowledge or understanding we do not have correct here on earth the Lord will I’m sure straighten us out on up in Heaven. In the end there are many Churches and Church denominations but only One Christ and One Body of Christ which is made up only of Saved Believers (Jews & Gentiles) and we are all joined together through the Spirit of God.